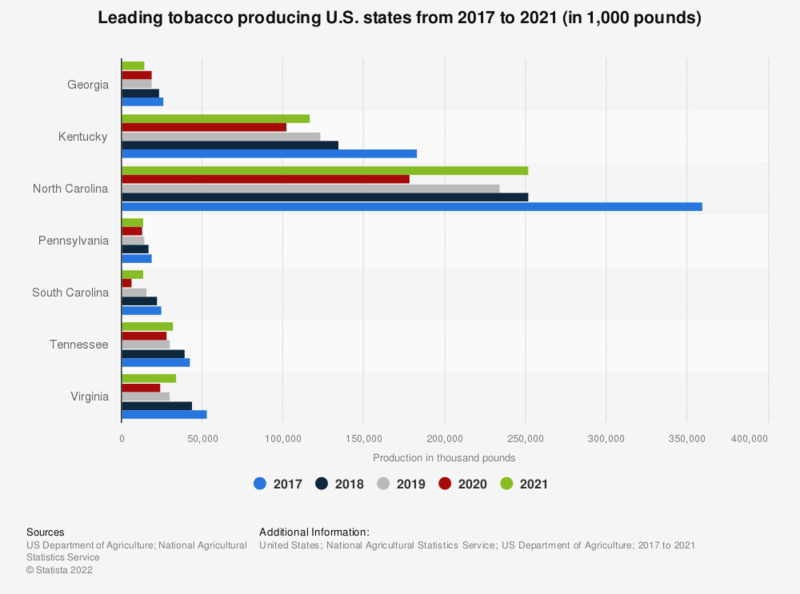 This statistic shows the leading U.S. states based on tobacco production from 2014 to 2018. In North Carolina, some 331.8 million pounds of tobacco were produced in 2016. China was the biggest tobacco producer worldwide in that year. Tobacco is a plant product containing mainly nicotine, cellulose, ammonia, and protein. In order for tobacco to be suitable for human consumption, the tobacco leaves are dried and cured after picking them at the plant and separating them from their stems. Various tobacco products can be manufactured from the processed dried leaves including cigarettes, cigars, chewing tobacco, pipe tobacco and shisha tobacco. Tobacco production is mainly concentrated in areas with a mild and sunny climate, which is suitable for cultivating tobacco plants. The leading tobacco producing states in the U.S. include North Carolina, Kentucky and Virginia. North Carolina lies in the Virginia-Carolina tobacco belt and topped the list in 2016 with a tobacco production over 331 million pounds. In the United States, the legal smoking age varies by state and starts around 18 years. In addition, smoking bans and taxes are regulated individually by each state. Some states have implemented state-wide smoking bans in all enclosed public places. On the manufacturer side, the industry is dominated by key players including British American Tobacco, Imperial Tobacco, Japan Tobacco International, and Philip Morris International.